Experience: The Blog: #OscarsRTM: Real-Time Marketing or Real-Time Misfire? #OscarsRTM: Real-Time Marketing or Real-Time Misfire? You're at a party visiting with friends when out of the corner of your eye you spot a stranger eavesdropping. A friend mentions she watched the Oscars, and the stranger pounces. "I work for Oscar Mayer. What a coincidence!" After an uneasy moment, another friend mentions he just saw "Les Miserables," when suddenly another stranger interrupts, "I thought Les Mis would win--could you please tell everyone at the party?" This uncomfortable and preposterous social situation is a pretty fair analogy for what passed as "Real-Time Marketing" (or RTM) on Oscars night. Oscar Mayer posted a humorous tweet about how it was trending (Oscars/Oscar--get it? 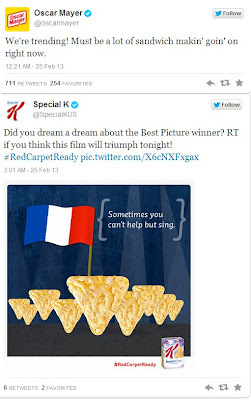 ), while Special K tried to achieve virality by asking people to retweet its prediction that Les Mis would win an award. Oscar Mayer received more than 700 retweets--a more than respectable number--but Special K's image received just six retweets, half from people who appear to have a relationship with the brand (and only one of whom disclosed it). Oscar Mayer and Special K were hardly alone. I won't attempt to provide an exhaustive list of the largely ineffective social media RTM that occurred Sunday evening, but you can see more at Jay Baer's "Convince and Convert" blog, where he does a fine job furnishing examples and commentary. The evening of the Oscars, David Armano launched a hashtag, #OscarsRTM, to discuss the night's real-time marketing. He was dismayed when the hashtag conversation became "a constant stream of snark, dismissal, critique and a never ending barrage of 'not impressed.'" David particularly objected when someone in the #OscarsRTM stream unkindly edited a photo of the U.S. Cellular "2013 Oscars Newsroom." David rose to U.S. Cellular's defense, noting "they are TRYING to provide relevant content vs. just doing straightforward advertising." I have tremendous respect for David--he has been a thought leader leading the charge for social media for longer than most social media professionals even knew what Twitter was--but this time I think David is wrong. What U.S. Cellular did on Oscars night was not "provide relevant content;" they tweeted ads. Each tweet contained an image attempting to tie the brand to one of the Oscar-nominated films. The problem with the social media RTM that occurred on Oscars night is the "M" in RTM. The intent of these brands was clear to everyone--not to add to the conversation or enhance others' enjoyment of the Oscars but to create value for themselves. Almost none of the brands attempted to engage others in a dialog--they instead broadcast a stream of brand messaging. Many brands tweeted their social advertising using the same #Oscars hashtag that consumers adopted for their conversations, which demonstrates how much RTM on Oscars night was less about social engagement and more about old-fashioned one-way interruption advertising. When brands like Oreo and Tide demonstrated wit and agility with funny posts during the Super Bowl blackout, social media RTM seemed poised for growth. Just three weeks later, the pre-planned, unfunny, heavy-handed, brand-centric posts of Oscars night managed to make RTM look not like a fresh, new strategy but old, tired marketing-as-usual. Not every brand fell into the trap of talking about themselves. Victoria's Secret participated in social media as people would, commenting about the Bond girls, complimenting Jennifer Hudson's performance and raving about Anne Hathaway's dress. Mercedes-Benz's Smart USA Twitter profile made creative use of Vine to honor the Oscar winners while inventively pimping their products. My personal favorite tweet of the evening was Chobani's, which made fun of the fact they could not get legal approval for their Oscar tweets. Don't broadcast; spark and engage in conversation. Respect that you are part of the consumers' social channels and consumers' dialog. Be spontaneous. The more you plan and prep, the less surprising, unique and topical your content will be. Watch for the unexpected to occur--such as the lights going out in the Superdome--and be ready to produce something timely. True RTM happens in real time; that's why it is called "real time marketing." Engage emotions. Make people laugh; make them cry; give them something to think about; furnish them with something they will want to share or discuss. If you cannot do this, then maybe your brand is better saying nothing at all. Pay no attention to the man behind the curtain. No one wants to see how the sausage is made--they don't care how your magazine ad is produced or that your social team is standing ready to tweet marketing content. U.S. Cellular misstepped by retweeting an employee's photo of its social newsroom; it invited--and received--criticism. In 2013, it can sometimes seem social media is a mature medium, but Sunday night proved that we are still feeling our way through this new channel with its new rules. A lot of brands paid employees and agencies to work on a Sunday and stay up late creating opportune content. Very few brands got enough bang for their buck. Either marketers must do much better to be authentic, relevant and interesting in the moment, or they should just let their employees enjoy the Oscars and other big events from the comfort of their homes. Precisely. Thanks for the kind words. RTM without the RT is just a campaign deployed at a specific time. Thanks, Jay, I'm glad you approve. You're right about the lack of RT in RTM. We've been scheduling campaigns online for over a decade--that's hardly new. I was disappointed with how little "real time" there actually was in "real time marketing." And, BTW, aren't we supposed to be more excited in social media in engagement than in broadcasting messages? Why is RTM even a thing? Why not RTE--Real Time Engagement--instead?